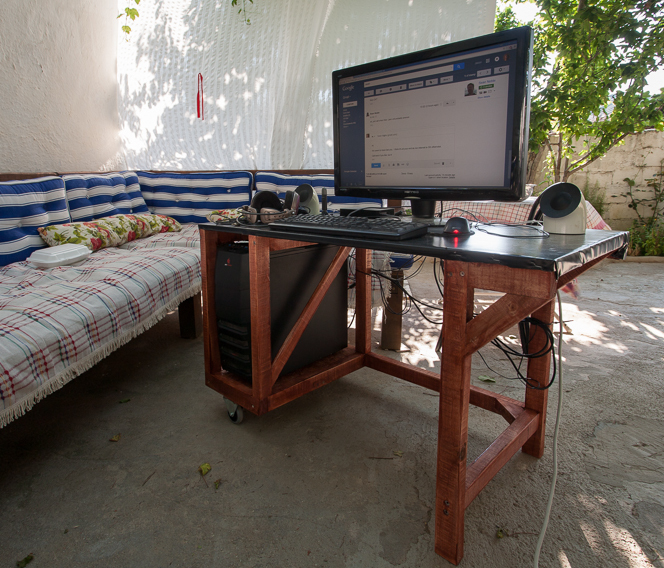 As promised, some photos of the finished furniture that Joe helped to make. The desk is great for days when it’s too hot to sit inside with a PC exhaust fan going, and the cupboard is built like a tank and will outlast us all. 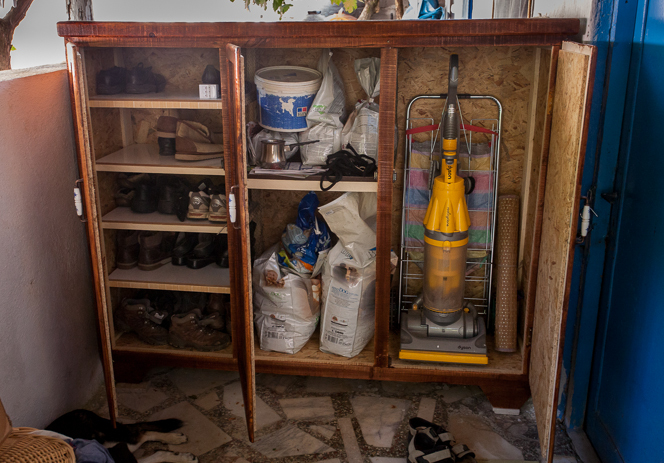 So much room for shoes, pet food, vacuum cleaners, etc. Also, some gratuitous kitten photos. In another few weeks, we will have been here for a year. Predictably, the time has flown past, and I suppose I should be more worried that we don’t have any new buildings yet. But I’m still happy with our progress: we’re getting there. The bureaucratic checklist is nearly complete and we should be able to break ground on the foundations for the cafe and bungalows soon. In the meantime, summer has definitely arrived. Afternoon temperatures are in the mid 30s, and we can go for a couple of weeks without any rain. The sea has warmed up and an afternoon swim at Pamucak Beach or in the Dilek National Park is always tempting. Visitors continue to give us a good excuse to get out and discover all the fantastic places around us. I know I keep going on about ruined Ionian cities, but there really are dozens of them around here. 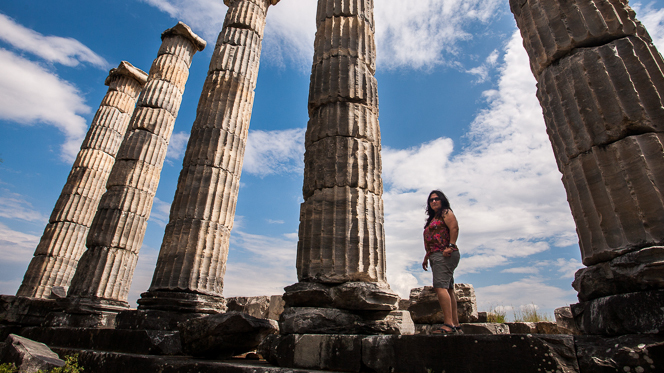 Priene was one we hadn’t seen before. 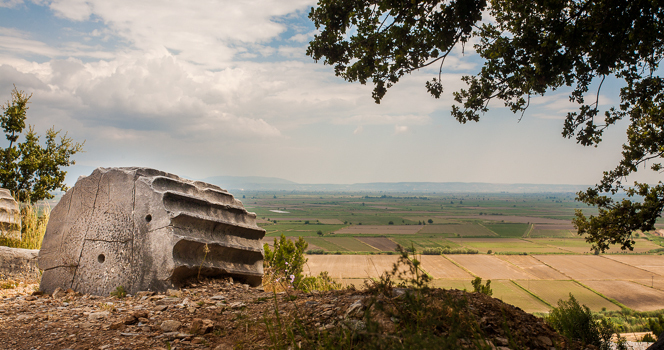 It sits up on a bluff overlooking the mouth of the Meander river, and is only a few kilometres from the site of the Battle of Mycale where the Greeks destroyed a retreating Persian force in 479 BC. Priene is big enough and famous enough to have a ticket office and a very reasonable admission charge, but like Tralleis and Magnesia, we had the place pretty much to ourselves. It is a great spot to visit on a hot day, because the elevation means you get a breeze coming in from the sea, and the encroaching pine forest gives a lot more shade than at other more exposed sites. View from the ruins of Priene out across the Meander Valley. 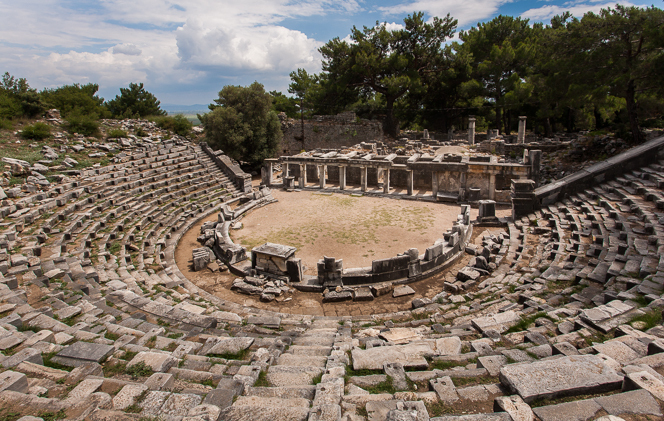 Priene is also close to the half-abandoned, half-restored village of Eski Doğanbey, so we dropped in for another visit. I can’t help taking photos there. 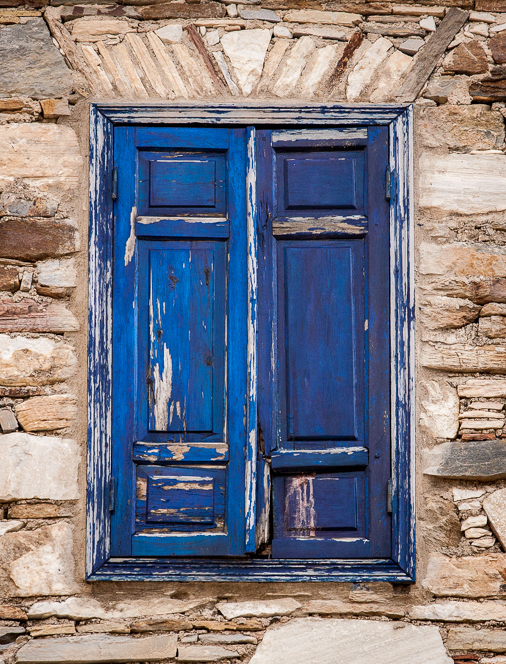 Blue shutters in Eski Doğanbey. 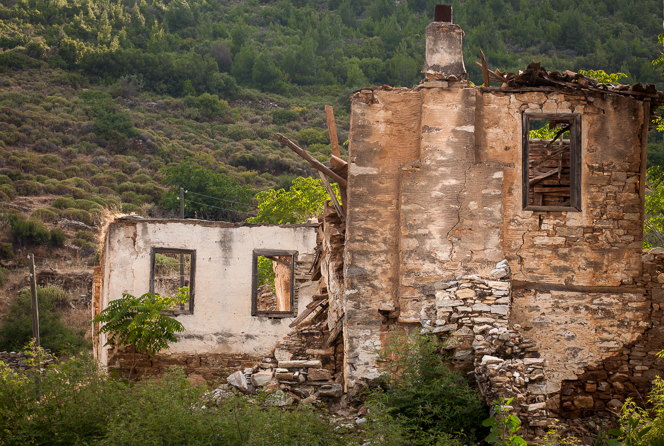 Renovation project, would suit first-time buyer. Our guest that day was Mark, an old friend of mine from Australia. 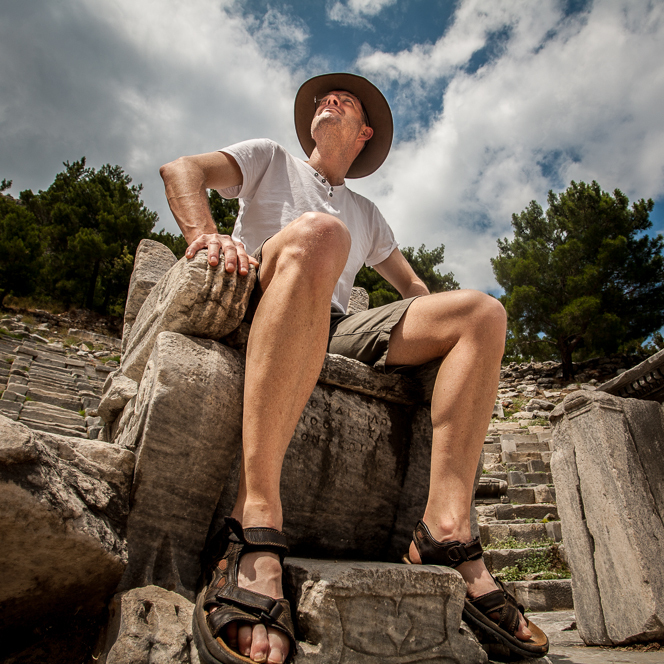 Here he is getting comfortable at Priene. Mark was only here for a few days but I hope we helped him to unwind. A game of thrones: Mark briefly appoints himself king of Priene. The day after Mark left, Joe arrived for a two-week stay. Joe is a friend of ours from Southampton, and a former work colleague of mine. He wanted to get some sun before an imminent move to Norway. Anyone considering visiting us in the future should know that Joe has set the bar very high in terms of helping to build things. He helped do the last of the cabinet doors in the kitchen, as well as a large (and very heavy!) 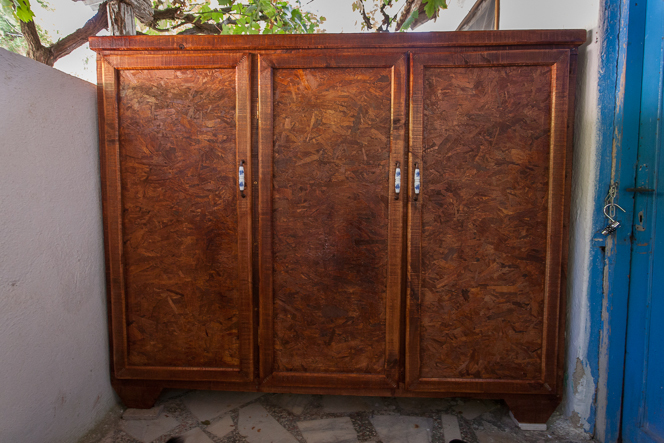 storage cupboard for the verandah, and a computer desk on wheels that makes it much easier to watch movies at night in the courtyard. Joe, thanks again. 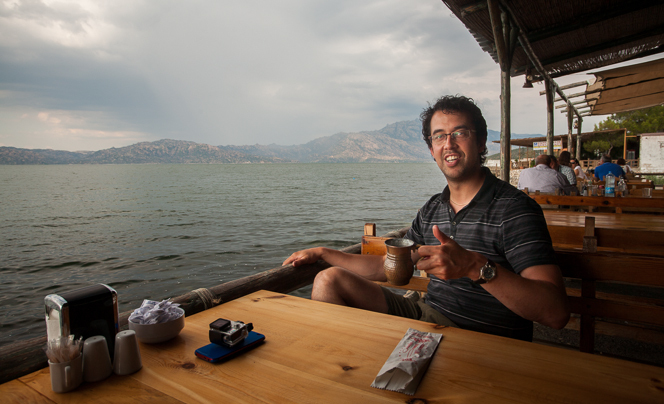 Joe enjoys a mug of refreshing ayran (yoghurt, water, and salt) at a lakeside restaurant. The storage cupboard and the computer desk deserve photos but I’m going to wait until they’re sanded and stained, etc., so Joe’s efforts get the best possible presentation. Also, for anyone who wants to see Ephesus but only has 37 seconds to spare, I give you Joe’s GoPro video of his visit. Most of our visitors have arrived at Izmir airport, about an hour to the north, but Joe flew into Bodrum/Milas, which is south of us and a little further away. The drive down there is interesting, as the middle section runs along the shore of Lake Bafa, which was once part of the Aegean Sea until the Meander River silted up and blocked the connection. 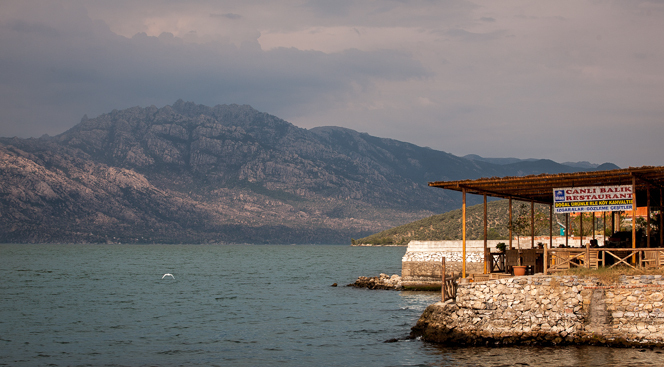 Fish restaurant on the lake. On the way back we saw brown tourist signs for “Euromos”, a city we’d never even heard of. 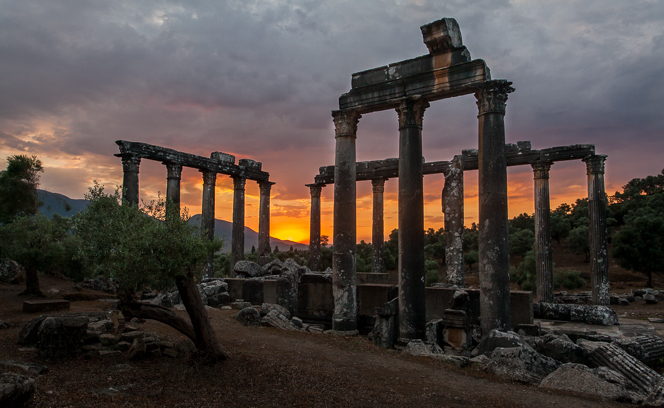 Very glad we stopped though, as we got to see the sun setting behind the Temple of Zeus. The Temple of Zeus at Euromos. Summer has also brought a different species of visitor. We try to be responsible pet owners and get all of our animals spayed as soon as they’re ready. 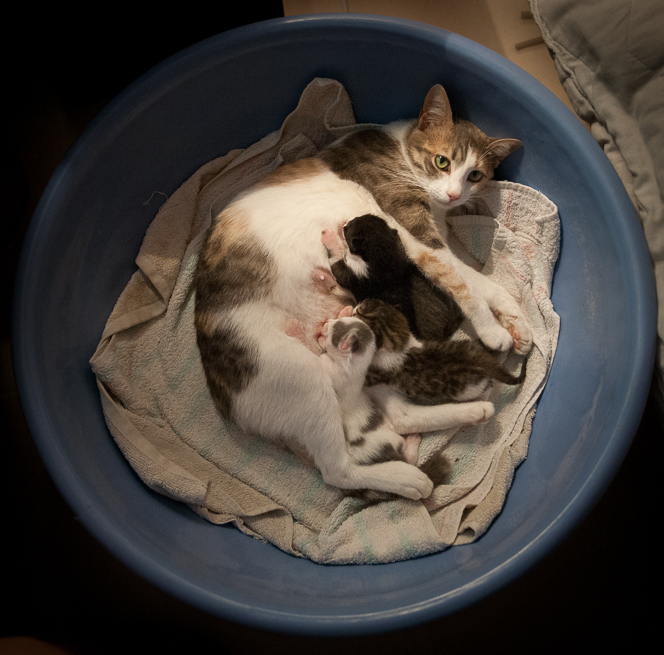 But our youngest cat, Sookie, got pregnant sooner than expected and we missed our chance. (If your vet tells you six months, do it at five.) 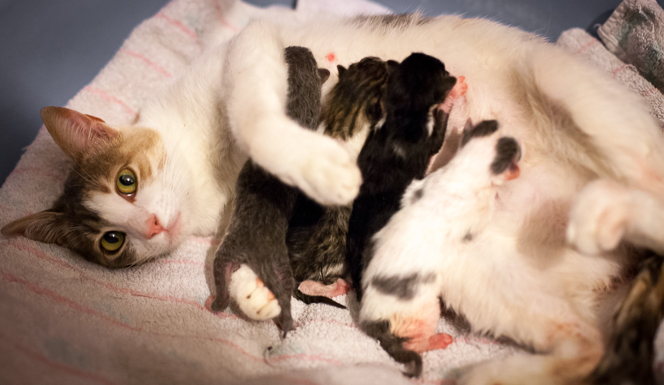 So we are now the proud and slightly alarmed grandparents to four new kittens. 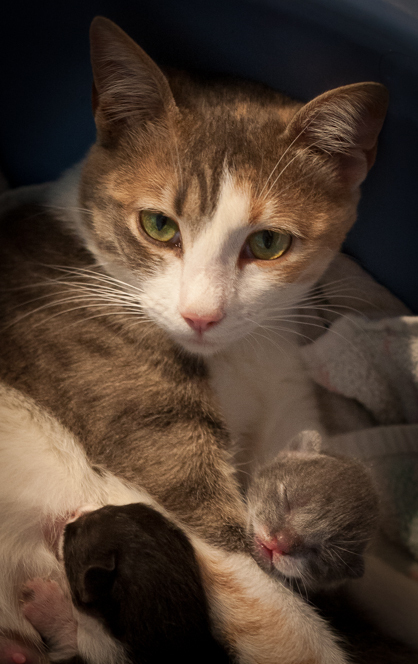 The proud mother with her kittens, less than 24 hours old. Time flies. There’s now less than a week to go before the removal company comes to take all our worldly goods away. So we’re frantically preparing by making an inventory for the insurance: how much does it cost to replace an ageing CD collection or a drawer full of mismatched socks? We’re recycling junk from the attic, based on the theory that a box you haven’t opened in seven years probably doesn’t have anything in it that you really needed. And working our way down that long, tedious to-do list that all movers have to deal with: banks, phone, internet, gas, electricity, driving licence, etc. 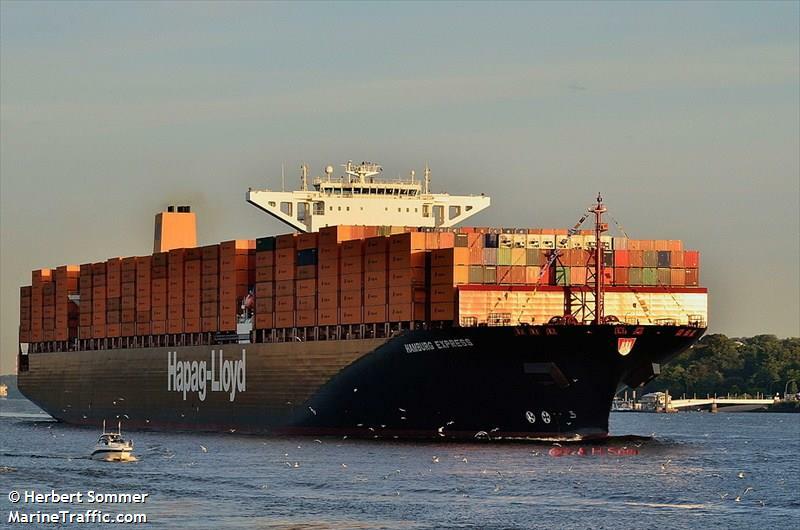 We found out today that our shipping container will be travelling on the 366-metre-long Hamburg Express, direct from Southampton to İzmir. Here’s hoping our box doesn’t fall off the side. The ship that will take our furniture to Turkey (credit to Herbert Sommer and MarineTraffic). Before we go, we want to thank all of our friends, neighbours, and colleagues for the warm send-offs we’ve been given. You have all been incredibly thoughtful. We’re determined to get out to Turkey and to start this new chapter in our lives, but that doesn’t mean we won’t miss you. And some days it seems as though even the British weather is trying to convince us to stay. 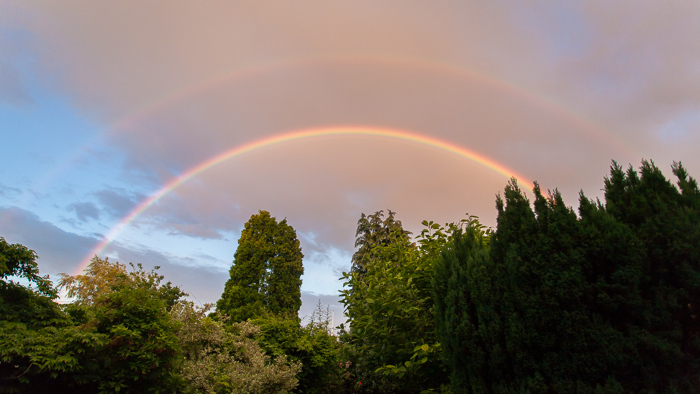 I took this shot of a double rainbow from our back garden a few days ago. If Southampton always looked like this after rain, we might have had a tougher decision on our hands. Double rainbow from our garden in Southampton.